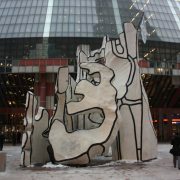 On October 24, 2016, Mayor Rahm Emanuel, in conjunction with the Chicago Department of Cultural Affairs and Special Events (DCASE), declared 2017 the “Year of Public Art” in Chicago. This will be ushered in through projects like the 50×50 Neighborhood Art Project, where Alderman from all 50 Wards may use up to $10,000 of their budgets to finance permanent art installations in their area (which the Mayor will match). As noted on the City of Chicago website, the project will invest one million dollars into neighborhoods for local artists to work there. Art related events will also be held at museums throughout the city such as the DuSable Museum of African American History, the South Side Community Art Center, the National Museum of Mexican Art, and the Chicago Cultural Center. All of these play a role in Emanuel’s “Chicago Cultural Plan”, which has increased attention toward Chicago’s public libraries, CTA stations, and public parks. 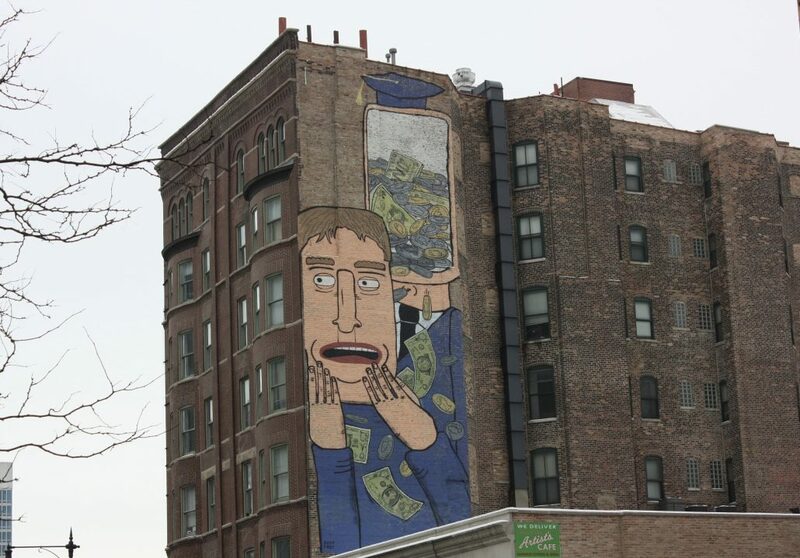 Chicago is known for its public art. Many sculptures and murals are central to the city’s image such as Monument with Standing Beast, Four Seasons, and the Flamingo (all pictured below). 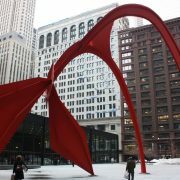 Many of these are located in the Loop: however, these are just a small selection of the neighborhood’s ever-growing art presence. Earlier this year, the Mayor and Columbia College Chicago teamed up to increase art in the South Loop area, showing what similar development during the ‘Year of Public Art’ could look like. 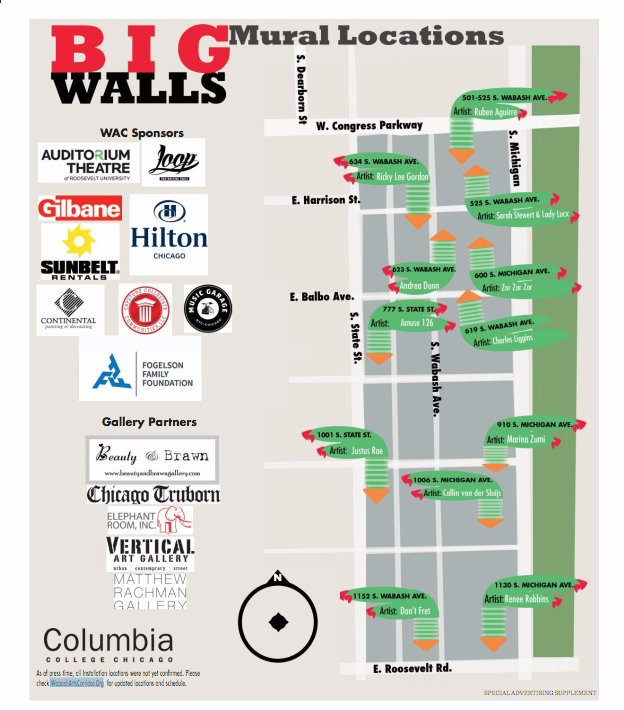 The Wabash Art Corridor (WAC) in the South Loop presents Chicago as a ‘living urban canvas’ through their BIG WALLS project. 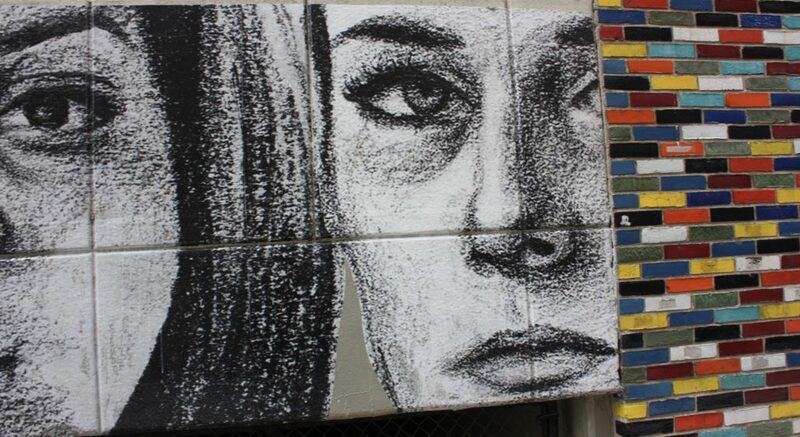 In collaboration with Columbia College Chicago, WAC brought initiated twenty mural installations by both local and world-renowned street artists. The project was launched last May (incorporating pieces installed over the last few years) with events surrounding the project running throughout 2016, including guided ‘Corridor Crawls’ of the pieces. WAC serves as a part of the greater Chicago Cultural Plan in 2013, hoping to increase Chicago’s image as a cultural hub and bring together the talents of local artists in the city. Below are a few of my favorites from the collection. 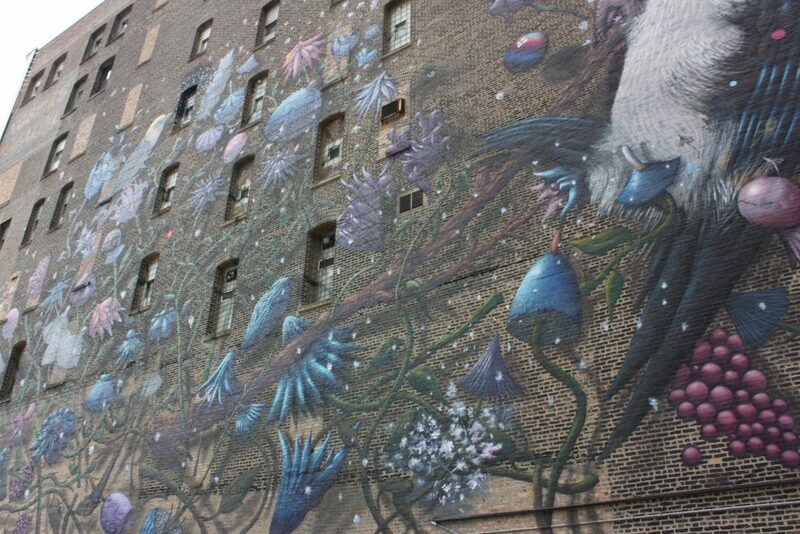 Keep your eye out for these and many more pieces next time you are in the South Loop neighborhood! Tatyana Fazlalizadeh’s series “Stop Telling Women to Smile” addresses the ongoing street harassment of women, drawing from her own and other women’s experiences. Fazlalizadeh interviews individuals about their experiences with harassment before drawing their portrait. She turns this into a poster, including a small message or theme from the interview. Fazlalizadeh then pastes the posters throughout the city, hoping to create a conversation around harassment in that area that it occurs. The project began in Brooklyn in 2012 and has now expanded worldwide to Mexico City, Paris, and now Chicago. 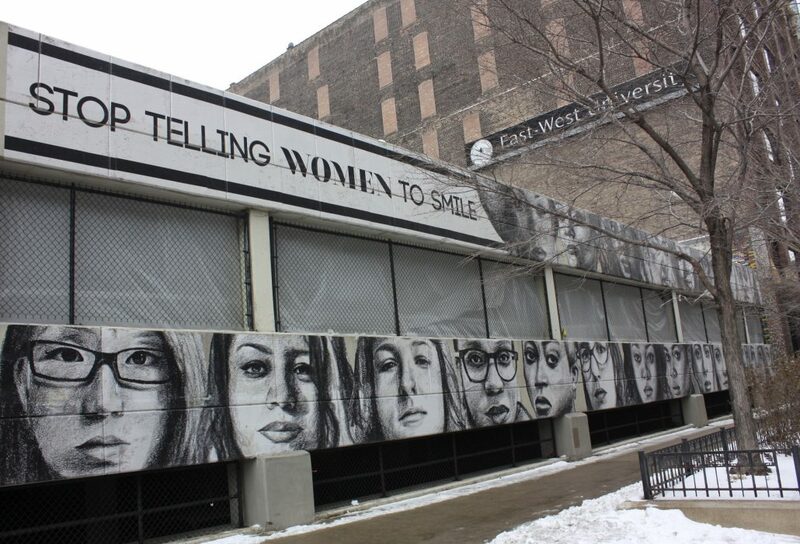 Here Fazlalizadeh features over a dozen hand-drawn images of women with one central message: Stop Telling Women to Smile. 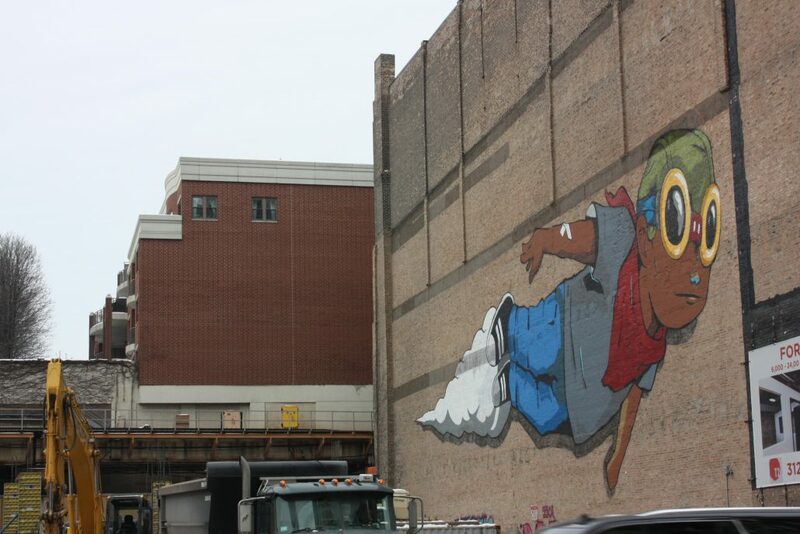 Flying outside the Roosevelt L Station, Chi Boy was one of the earliest murals of the Wabash Arts Corridor project. Hebru Brantley, a Chicago native from the South Side, says his style “derives from graffiti-worn buildings and sneaker-hung telephone poles honoring memories of local legends” Based off his ‘Flyboy’ character, who is personalized for each of Brantley’s murals, Chiboy rockets across the building, hoping to empower and bring hope to all who see him. 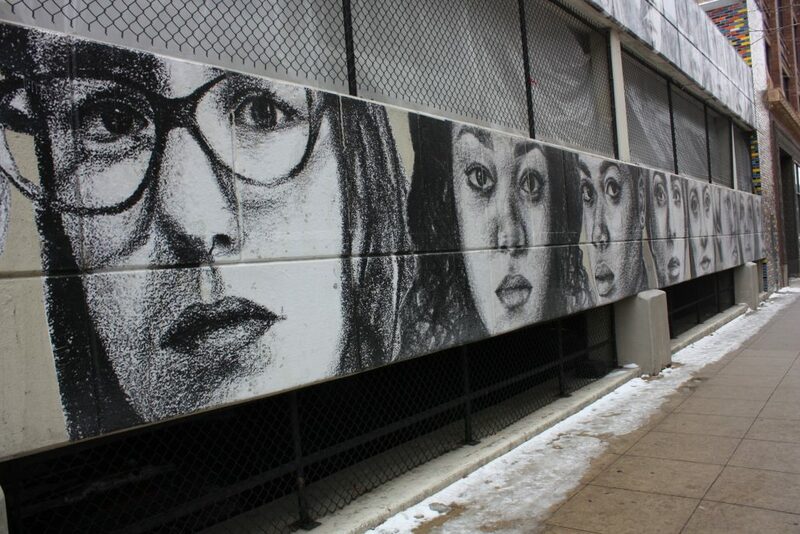 Brantely’s work can be found throughout Chicago including at the Cermak-McCormick Place Green Line Station, outside the Lincoln Square Athletic Club, and on the Uptown Broadway Building. 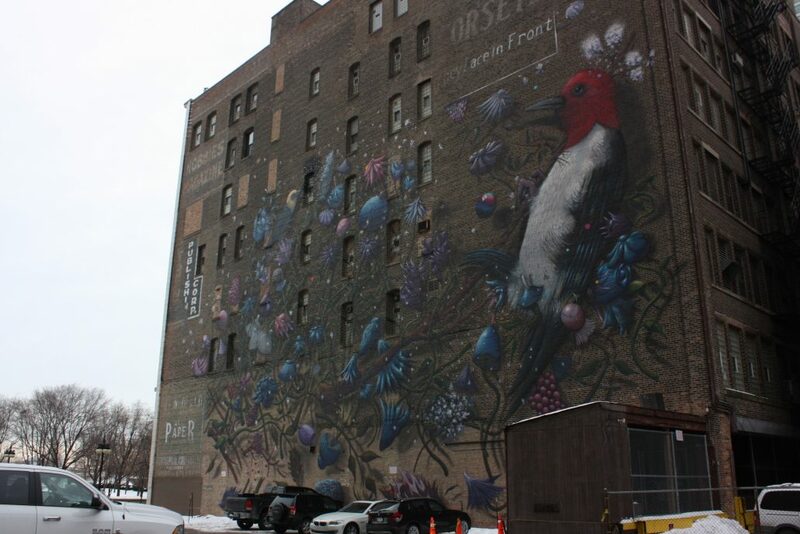 Artist van der Sluijs use this south Michigan mural to showcase two endangered Illinois birds, surrounding them with local flowers. After researching native birds of Illinois, the artist chose to highlight the Yellow-headed Blackbird and the Red-Headed Woodpecker, which have all but disappeared from the Chicago landscape. 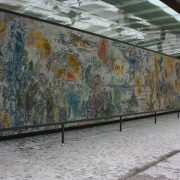 He hoped to highlight that while these species are dying, there is still time to prevent them from extinction. Though he hails from the Netherlands, Collin van der Sluijs is no stranger to Chicago, having painted murals in the Pilsen neighborhood and hosted shows at Vertical Gallery. The artist, known as Don’t Fret, is a Chicago native and alum of Columbia College. He is one of three Columbia College alum that were brought back for the Wabash Art Corridor project. He notes the piece is reminiscent of his time at Columbia, describing it an interview with the Columbia Chronicle as reflective of his ‘“glass half-empty” personality’ and finding the humor in darker subjects. He has worked both in galleries on the street, displaying his work in cities like New York, Miami, São Paulo, and Berlin. Make Your Own Luck is a part of the Vertical Gallery’s ‘The Power of Paint’ series, promoting how visual art can help others. As a part of this campaign, the duo ASVP donated part of their commission to charity. 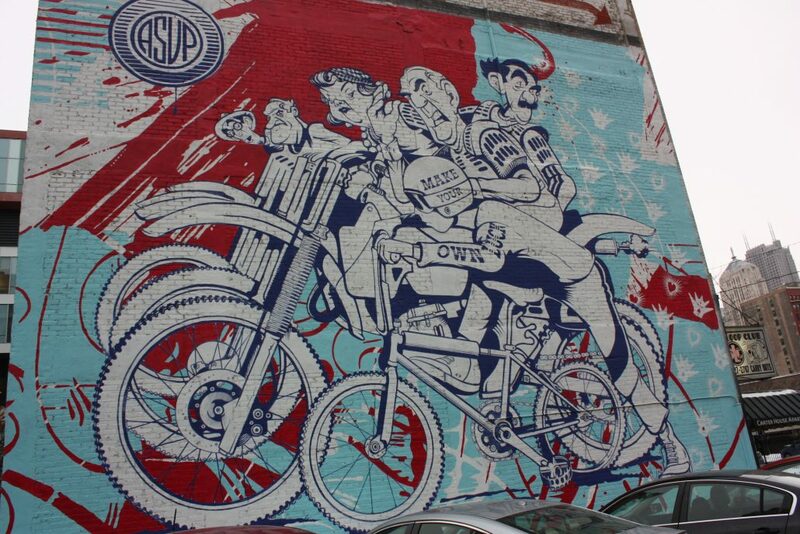 ASVP utilizes hand-drawn, comic style paintings in bright colors and have worked both nationally and internationally. They are based out of Brooklyn, New York.